For the past couple of months I have really stepped-up my writing schedule. I’ve been blogging, writing and posting short pieces while working on a couple of larger ones, have joined a local writer’s group, and have even managed to play World of Warcraft only about once per week. I have also been working on role-playing game materials, which counts because it is a) creative and b) words on the page. Despite all of this, I’m starting to feel a little negative about my effort. I’ve found myself checking my site visits on each of my blogs to see if anybodyis reading. Some people are…I’ve actually gotten comments from people I don’t knew in “real life” which is exciting and almost like being published. But mostly, no. I’m not even certain if my wife reads my blogs. My personal blog is titled “Whistling in Dark”. Usually this phrase refers to someone who is unwarrantably positive. For me it refers more to the fact that I’m whistling away a merry tune but no one is listening. Thus my growing cynicism and frustration. If a writer has no audience, what is the point? If I can’t get people I know and who like me to read my stuff, how can I expect others to enjoy it? Do I have no comments because people don’t want to hurt my feelings? Is it that bad? Kristine Kathryn Rusch has been posting some really useful blogs under the banner of a “Freelancer’s Survival Guide” (also see my Blogroll). Her latest entry is on staying positive. Here she offers some great advice to the aspiring writer on how to maintain a positive outlook in the face of rejections, money stress, creative blocks, and all the other bumps that come along the road to freelance success. “Remaining positive sounds like such a minor thing. Yet it is the key to everything. Oddly enough, successful freelancers are the most cynical, hard-bitten optimists in the entire world. We don’t have a boss to whip us into shape. For the professional, you don’t have the luxury to be in a funk…you don’t write, you don’t eat. But first and foremost, we write because we want to. We need to get words on paper and get them out there for the world to see…even if everybody is facing the opposite direction. Staying positive takes work. It takes focus. “First, you need confidence in your work. Most of us don’t have it. If pushed, we confess to all kinds of insecurities, problems, reasons why our work isn’t as good as it could possibly be. Here’s the rub. To be a good writer you have to believe in yourself. In order to believe in yourself, you have to do a good job. The solution? If you’re not confident, fake it. Real confidence will catch up on its own. Think of it as maintaining a “professional” distance. Do what it takes to keep yourself in the game. The only way to improve and hone your abilities, and thus gain real confidence, is if you don’t let your lack of it right now keep you from moving forward. However, while acting confident you’ve also got to maintain a realistic outwork on what you are doing. People probably don’t read my blog for a variety of reasons. While I think my blogs have a unique point of view and style, they are, in fact, one-in-a-few-million. There are so many blogs out there that they get buried in the white noise that is the blogosphere. My friends and family do, in fact, have lives. As hard as it is to believe, my writing life is not as immediate to them as it is to me. There are other things to do than go to my blog when they can hear me ramble in person. I also know that my friends and family come from a variety of backgrounds; they range from high-functioning tech geeks to the downright technophobic. For some of these folks, unless I print it out and hand it to them personally they are not going to find it. I’ve really only gotten started. I have gotten some responses; some of them from professionals in the field. It takes time and I’ve got to let it take time. Like a lot of people who discuss positive thinking, Rusch suggests keeping an account of the good things that happen in your writing life. Did you sell a story? 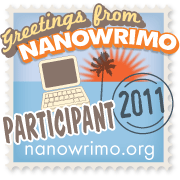 Did you make and accomplish a daily writing goal? Did you get some positive comments? If you keep an accounting of these you can go back and look at them later. I can say from experience that the few comments I’ve gotten have been positive and I still get a charge from reading them now. We tend to remember the negative more often than the positive. It probably has something to do with our “lizard brains” attempting to protect us from the bad stuff by keeping it fresh and real to us days, weeks, even years after the fact. I’ve come to the conclusion that there is no trick to focusing on the positive; you simply must do exactly that…focus. It is an action, a movement, an effort to remember why you do what you do, the benefits you’ve gotten and continue to get from it, and to use that memory to push yourself farther. When I get bitter and cynical about how “nobody reads me anyway”, I’ve got to remember why I’m doing this. Is it to be read? Well, frankly, yes this was a big hope of mine. But is it worth it even if it is just for me? I still think that it is. And I suppose that if it ever isn’t worth it, then it’s time to pack it in. The trick is remembering this when I go to my blogs and see no visitors…or even worse, visitors who say nothing about what they read (paranoia is very real for the aspiring writer). I’ve got to keep this advice in mind when I start beating up on my draft and let the beating carry over to myself. It’ll be work to be sure. Writing is an insecure profession that often attracts insecure people doing things in isolation. This kind of environment produces huge puddles of paranoia that breed the gadflies of doubt. But, I continue to work and to play and, hopefully, only indulge in self-pity for short bouts between blog entries. And if you see me and I’m not quite paying attention to what’s going on around me, be assured that while I’m having a wonderful time, I’d rather be whistling in the dark. This entry was posted in Ramblings and tagged lamott, motivation, positivity, rusch, they might be giants, writing. Bookmark the permalink.